Hey everyone, thanks for the feedback! just a little update, to fix a few things, hopefully the ramps are nicer to people now too. Also, here is the direct link to the HD version with the music. Here is my first track, and submission to the revolt community. It's based off a track from an old SNES game called "Biker mice from mars". Based off a TV show, it was a fantastic racing/combat game. 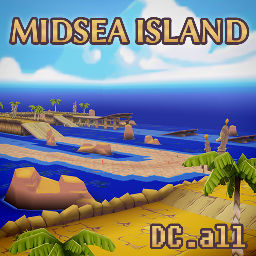 I chose the first beach track, MidSea Island. All models and assets are made by me, some textures are ripped from the original stage, some are completely hand painted by me. Music has been removed and quality of images lowered to comply with Re-Volt Zone upload guidelines. If you want the OST and Higher quality textures, please find the link over on the RV-Live forums!